2014 CCMA Annual Meeting & The 13th China Construction Machinery Development Forum was held on 6th Nov, 2014 in Hefei city, Anhui Province of China with more than 300 representatives from government departments, CCMA & branches, company executives and press of the industry presented. The conference was hosted by Mr. BaiFeiping, vice chairman of CCMA and the president of XGMA. First of all, Mr.Wangxiang, vice mayor of Hefei and Mr. Zhang Dejin, the president of HeLi addressed the conference, and gave a warm welcome to executives and representatives from all fields of construction machinery industry. Then, Mr. Jing Xiaobo， vice director of operation and monitoring bureau of Ministry of Industry and Information Technology of China (MIIT) gave an important speech about China’s supporting policy in developing emergency rescue equipment and system, and encouraged CCMA member’s to continue developing such rescue equipment, which is followed by Mr. Wang Jianyu’s speech in respect of drafting “the 13th five-year development plan” and “enhancing foundation program”, who is head of heavy equipment department at MIIT. 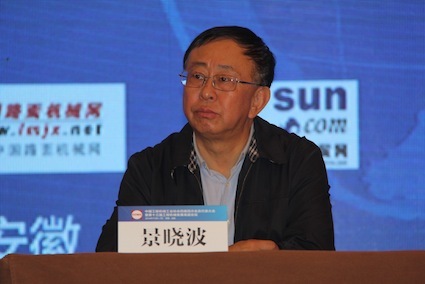 After that, Mr.Qijun, chairman of CCMA made a report about China construction machinery development trend, which is titled as “transition & up-grading , build a strong China CE industry”. Mr. Su Zimeng, vice chairman and secretary general of CCMA made a report about CCMA 2014 work summary and 2015 work plan for and on behalf of secretariat of CCMA.